Other Products by Before You Speak. Search other Energy Supplements products. Have you ever wanted to boost hair, skin and nail health by drinking a delicious cup of hot coffee? How about a fresh crusty loaf of bread dripping with creamy butter that helps you burn fat? Well, the bread hasn't been invented yet, but fear not, the coffee has! Before You Speak Glow Collagen Coffee is here ... delivering collagen-boosting factors and single-origin coffee with unrivaled energy and flavour. Sorry, did you get excited about the bread? Well, coffee is actually a proven metabolism booster due to it content of caffeine and chlorogenic acids1. That's something, right? This fortified coffee powder makes life just that little bit simpler, keeping pill-popping to a minimum. Marine collagen is an excellent source of bioactive collagen factors that assist with the maintenance and repair of skin. In addition to this, each cup of hot steaming coffee comes with lysine and proline, two important amino acids for the synthesis of hydroxylysine and hydroxyproline. These two hydroxylated amino acids are essential for the strength and integrity of collagen-based protein structures. However, this super-smart formulation doesn't stop there. Guess what nutrient the body needs to convert these amino acids into their hydroxylated states? Vitamin C. And the highest natural source of vitamin C is a cherry-like fruit that grows on a bushy riveside tree in the Amazon, called Camu camu. And it is loaded with essential nutrients. 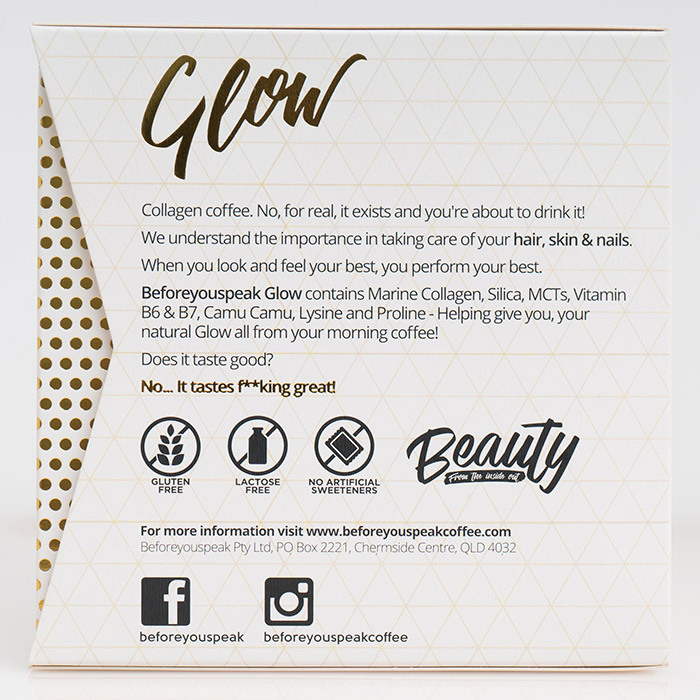 Before You Speak Glow Collagen Coffee also contains biotin, silica and vitamin B6, which are important nutrients for the health of hair, skin and nails. Marine collgen itself has been shown to boost skin elasticity, sebum production and dermal ultrasonic markers2. And with natural flavours, a natural sweetener and delicious aromatic coffee—clocking in at a lot less than a cafe-bought cup—this product will put a skin-enhanced smile on your face. Mix 1 sachet with 250ml hot or cold water and enjoy! 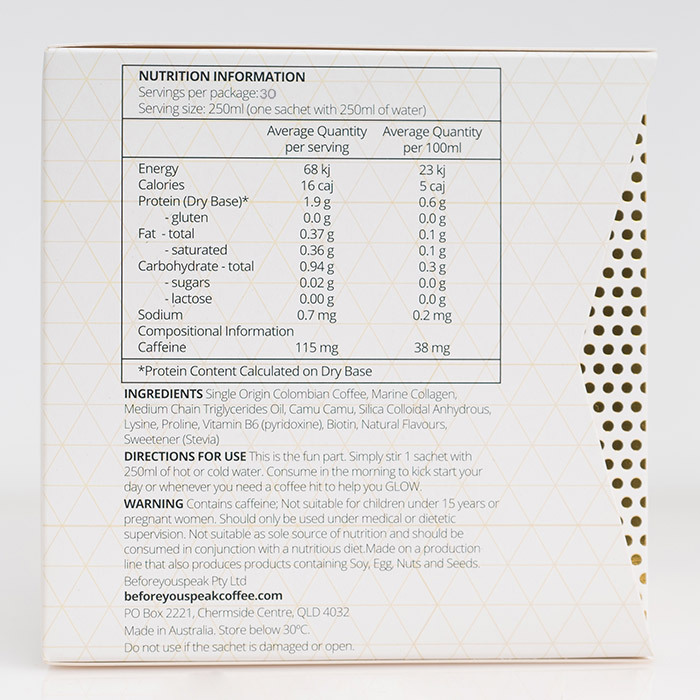 Ingredients: Single Origin Columbian Coffee, Marine Collagen, Medium Chain Triglyceride Oil, Camu Camu, Silica Colloidal Anhydrous, Lysine, Proline, Vitamin B6 (pyridoxine), Biotin, Natural Flavours, Sweetener (Stevia).